Get half off second guests AND FREE round-trip air when you book a Galapagos cruise on the new Celebrity Flora ship. The 19 islands of the Galapagos, known as the Enchanted Archipelago, is home to amazing and unique species of wildlife. It’s no wonder travelers from around the world come to these islands teeming with indigenous land and sea creatures and many species of birds. A Galapagos cruise is the trip of a lifetime and one that will leave lasting memories. Click here to browse our Celebrity sailings to the Galapagos. Enjoy an incredible Galapagos Islands cruise with this amazing offer from Celebrity Cruises. Celebrity has other Galapagos cruise ships, but their new ship “Flora” was designed specifically with the Galapagos Islands in mind, and you can get in on this special cruise deal which offers half off for the second guest AND FREE round trip airfare by Celebrity Air! You can choose from 10 or 11-night packages. Please call us today at 1.888.804.CRUISE (2784) so we can get you booked on one of these incredible cruises, help you plan any other detail before, during, and after your cruise with our free travel planning service. Let us create an awe-inspiring Galapagos Island expedition for you! Don’t hesitate as the booking window is between now and June 5, 2010 for cruises between June 30, 2019 and December 31, 2019. The Flora is unique in many ways and will be based year-round in the Galapagos. 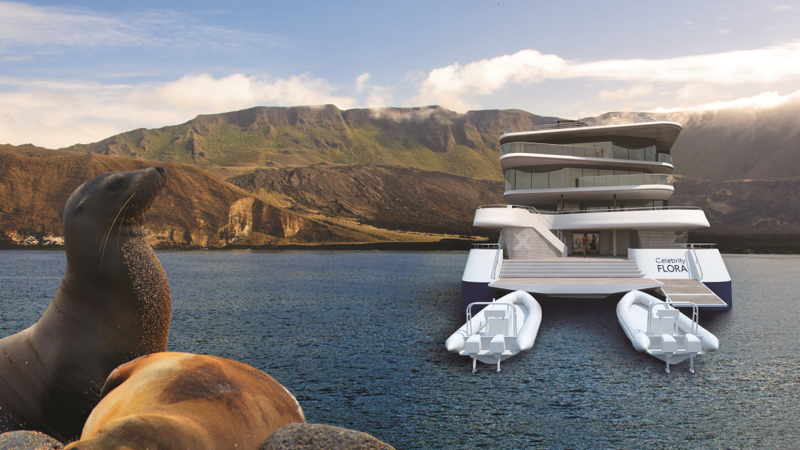 The all-suite accommodations are designed with unique viewing features that are not presently available on other ships serving the Galapagos Islands. The ship features all-suite accommodations with large spacious suites, some with “infinite verandas” and top tier suites include private balconies. Specially designed viewing features on the Flora are unlike any currently available on ships in the wildlife haven. Choosing Cruise Ship Rooms: What is a GTY Cabin?